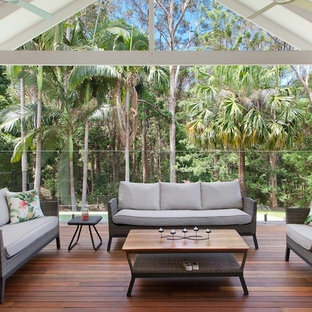 Australian and New Zealand outdoor living is hard to rival – the warm, temperate climate encourages the year-round enjoyment of backyards, courtyards, patios, verandahs and balconies. These alfresco areas, sometimes referred to as outdoor rooms, are so ubiquitous with the Australian and New Zealand lifestyles that they are now being treated the same way as any other room in the house in terms of architecture and landscape design. Modern backyards and gardens are now extensions to the home. 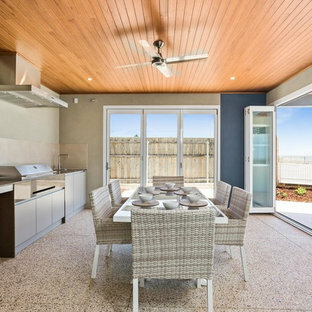 Even cooking is moving outside with many Australians and New Zealanders including outdoor kitchens in their home designs. Unlike the rest of your home, however, a backyard, patio or verandah needs regular attention, to ensure it doesn’t become overgrown with plants, or look drab when the weather turns. But clever decisions can reduce the level of maintenance needed to keep your alfresco areas and outdoor furniture looking fresh and neat. 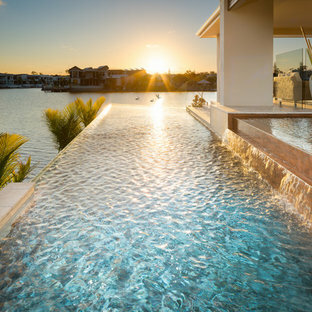 Browse the photos on Houzz for landscape architecture ideas, and engage with the outdoor specialists of your favourite picks, so you can make the most of your home’s outdoor living spaces. How do I decide on my landscape design? Before you dive head first into planning your outdoor areas, consider the site in which your home sits. Understanding your soil type, topography and climate will ensure you make the most of your site. Plants, for example, should grow comfortably in the climate and soil conditions, and complement the existing landscape. Next, take into account how you will use your outdoor areas and how much maintenance you can sustain. More hardscape – paths, walls, steps and decks – generally means easier upkeep. If you have children, you will want to divide your backyard into areas: you could opt for an entryway, entertaining area and play area. A sheltered area is usually a must, too, whether in the form of a pergola, awning or arbour. How much you entertain may dictate whether you want to include an outdoor kitchen, or even an outdoor bar. Outdoor specialists – landscape architects, landscape designers and garden designers – will be able to take your outdoor areas to the next level. 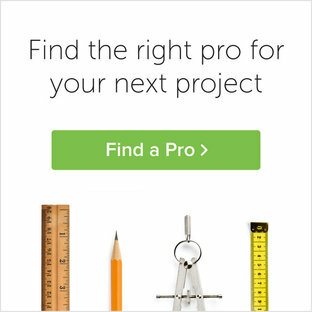 Just browse Houzz professionals for a full list of experts in your area. How do I create an outdoor room? Outdoor rooms take the comfort of the indoors outside. 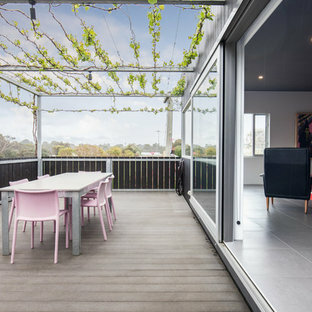 No longer just a covered area in the backyard, outdoor rooms have a visible connection to the spaces within the home. 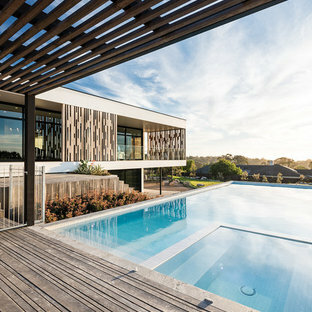 Laser-cut screens could create a sense of enclosure for a modern veranda. Or, a patio could be an extension of your living room, with leather or upholstered chairs substituted with outdoor-suited materials. Even the smallest of spaces can be transformed into outdoor rooms. An inner-city balcony, for example, could squeeze in a couple of chairs, a drinks table and a stylish shelving unit. Outdoor kitchens are one of the most popular types of outdoor rooms in Australia and New Zealand. They, too, can come in many forms, however many outdoor kitchens like to spill out from the interior. Those that stand their own often have a built-in barbecue, bar fridge, built-in sink and plenty of storage. A wood-fired pizza oven is just the cherry on top! How can I get the most out of my front yard? Your front yard doesn’t have to act purely as a transitional zone. A front fence can create privacy from a busy road and, in turn, open up the option of having a small courtyard in which you can entertain or relax in. Not having a fence, on the other hand, can make your front yard appear bigger, and will show off the architecture of your home. If this is the case, you may want to create a structural feature out of something like your letterbox. Pathways should be easy to navigate, well-lit and obstacle-free. 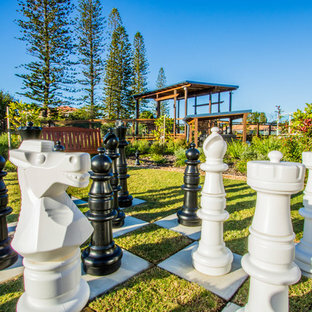 Add more functionality to your front yard with a bench seat or herb garden; or keep your focus on creating a welcoming entry with a water feature, sculpture or garden art. What small backyard ideas will maximise my space? 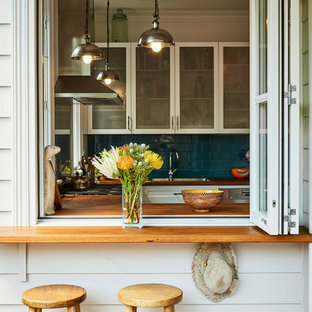 Small backyard ideas are plentiful on Houzz. You’ll notice terracing is popular in small backyards as it adds dimension and visually expands a small plot into distinct, separate spaces. Consider using large pots to break up the space, creating different points of interest, too. Next, think vertically. Tall plants are a great way to add height to a small backyard, or consider using a trellis, arbour or pergola to draw the eye up. Other small backyard ideas include complementing your interior with the same colours and style to make it feel more like its own living room; installing smart lighting that creates a backdrop or gently illuminates the area; and creating a focal point to distract the eye from the limited square meterage. What retaining wall options are available? A retaining wall isn’t just functional, but can add aesthetic value to your outdoor areas, too. Which retaining wall designs are best suited to you will depend of your budget, the incline of your slope, local regulations and the aesthetic you want to achieve. Timber sleeper retaining walls are the most common retaining wall, because they are relatively affordable; however, they do have limited longevity. If life expectancy is an issue, consider concrete sleepers, or clad the timer slats in Corten steel panels. A boulder rock bank is the most cost-effective type of retaining wall, and with the inclusion of plants, is often the most natural looking, too. Corton steel blades or rendered masonry walls can retain a small dip in your landscape and make an eye-catching feature, while masonry walls and drystone walls are the most expensive options, but do tend to look the best.